Although not officially announced as yet, work on the sequel to Obsidian’s charming and wonderful crowdfunded role-player Pillars of Eternity was all but confirmed back in May, when the company’s CEO Feargus Urquhart suggested it “seems silly” not to acknowledge the project’s existence. 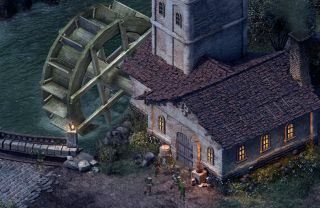 In an interview with Gamesindustry.biz, Urquhart now says the developer is “starting to move forward on Pillars of Eternity 2,” and that making a 3D action-RPG—similar to Skyrim but within the Pillars universe—is something he’d love to do down the line. Urquhart speaks frankly about the economics of running an independent studio that operates on a larger scale than most. He speaks of the ethics and moral quandaries of returning to the crowdfunding well for a second time, what he’s learned during his tenure at Obsidian, and the friction that can often occur when working alongside publishers, among other things. “We've thought a lot about what it takes to make a big game, and what's the reward we get for making a big game. For me to go off and do—and we're not doing this, but let's just say—Knights of the Old Republic 3, and it's going to cost $50 million, and I'll make $7.5 million on milestones and then maybe I'll make another $5 million in royalties. That's pretty good for an independent developer on a project. But, y'know, I can make more profit from two Pillars of Eternitys than I can from one of those games. And then on top of that, if it's a smaller game and it's successful, I'll own it. I'm not gonna own Star Wars. Check out the interview in its entirety over on Gamesindustry.biz.